FREE for Real Office users or $22.00 per month inc GST. Imagine all your property leads being automatically loaded into your own data base ready to email all your property listings from any source. Think of all the enquiries, all the time saved, all the wages saved. We capture all the data from realestate.com.au, domain.com.au, realestateview.com.au, and your own website and just about any source and load it into your CRM Database. You can see where the enquiry is coming from and also export the data into a csv file. 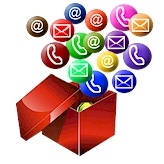 You are able to use this information for Email of normal post to address letters. Those of us in the real estate marketing world work hard to get contact details of visitors to your website and listed properties. Data containing names and email addresses from emails sent from portals such a realestate.com.au, domain.com.au and enquiry forms on your own website can be automatically channelled into a CRM to eliminate the work involved in manually recording these details. The data collected in this way provides a legitimate mailing list which is free of the concerns of sending emails which may be viewed as spam and the penalties which arise from sending unsolicited emails. Our system captures the names and addresses and writes them to a CRM (Client Manager) which can use them for lead generating and marketing emails and newsletters. The Sales Grabber is available on request at no charge to all customers using the Real Office property upload system, however we are now extending this offer to any agents for the small fee of $22.00 per month incl. GST who may use other property upload programmes but wish to capture the data sent in emails received from visitors to your property displays on any portal that you use.